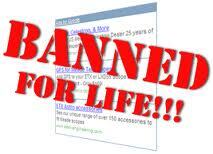 There are million of Adsense accounts get banned every day. Why? The answer is simple. They dom't follow the terms of service and program policies of Google Adsense. Google Adsense is the manin source of income for many Webmaster. If you are one of them, here are some points to consider to make sure that your account is safe. Publishers may not click their own ads or use any means to inflate impressions and/or clicks artificially, including manual methods. Clicks on Google ads must result from genuine user interest. Any method that artificially generates clicks or impressions on your Google ads is strictly prohibited. These prohibited methods include, but are not limited to, repeated manual clicks or impressions, automated click and impression generating tools and the use of robots or deceptive software. Please note that clicking your own ads for any reason is prohibited. Publishers may not ask others to click their ads or use deceptive implementation methods to obtain clicks. This includes, but is not limited to, offering compensation to users for viewing ads or performing searches, promising to raise money for third parties for such behavior or placing images next to individual ads. Encourage users to click the Google ads using phrases such as "click the ads", "support us", "visit these links" or other similar language. Place misleading labels above Google ad units. For instance, ads may be labelled "Sponsored Links" or "Advertisements", but not "Favourite Sites" or "Today's Top Offers". Publishers may not place AdSense code on pages with content that violates any of our content guidelines. Some examples include content that is adult, violent or advocating racial intolerance. AdSense publishers may not display Google ads on webpages with content protected by copyright law unless they have the necessary legal rights to display that content. Please see our DMCA policy for more information. AdSense code may not be altered, nor may the standard behavior, targeting or delivery of ads be manipulated in any way that is not explicitly permitted by Google. For instance, clicking Google ads may not result in a new browser window being launched. Publishers are encouraged to experiment with a variety of placements and ad formats. However, AdSense code may not be placed in inappropriate places such as pop-ups, emails or software. Publishers must also adhere to the policies for each product used. Integrated into a software application of any kind, including toolbars. Displayed in pop-ups or pop-unders. Placed in emails or in email programs. Obscured by elements on a page. Placed on pages published specifically for the purpose of showing ads. Placed on pages whose content or URL could confuse users into thinking it is associated with Google due to the misuse of logos, trademarks or other brand features. Placed on, within or alongside other Google products or services in a manner that violates the policies of that product or service. Sites showing Google ads should be easy for users to navigate. Sites may not change user preferences, redirect users to unwanted websites, initiate downloads, include malware or contain pop-ups or pop-unders that interfere with site navigation. In order to prevent user confusion, publishers may not display Google ads or search boxes on websites that also contain other ads or services formatted to use the same layout and colours as the Google ads or search boxes on that site. Although you may sell ads directly on your site, it is your responsibility to ensure that these ads cannot be confused with Google ads. Google uses the DoubleClick DART cookie on publisher websites displaying AdSense for content ads. Subject to any applicable laws, rules and regulations, you will have the sole and exclusive right to use all data derived from your use of the DoubleClick DART cookie for any purpose related to your business, provided that Google may use and disclose this data subject to the terms of Google's advertising privacy policies and any applicable laws, rules and regulations. If your current advertising services contract with Google or DoubleClick already has a specific provision defining data ownership, that provision instead of this policy will govern with regard to the data collected under that contract. AdSense for content: Up to three ad units and three link units may be placed on each page. AdSense for search: A maximum of two Google AdSense for search boxes may be placed per page. Also, a single link unit or a search box, but no other Google ads, may be placed on pages with AdSense for search results. Queries must originate from users inputting data directly into the search box and cannot be modified. This includes pre-populating the search box with terms or hard-coding direct links to search results pages. AdSense for search code may not be integrated into any software application such as a toolbar. 0 Respones to "How your Google Adsense account being banned You Never Get Banned if you did't do that"